(4) 20-watt halogen side lights illuminate displayed merchandise! 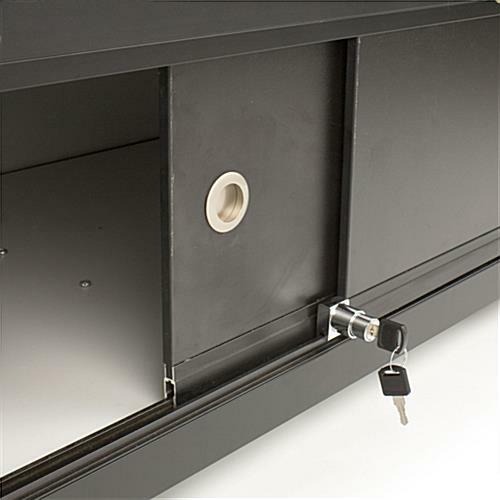 Locking bottom cabinet provides storage space! 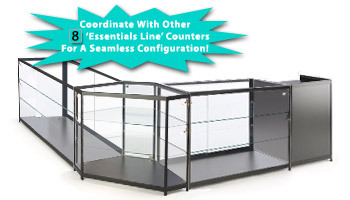 This glass counter is an ideal choice for busy retailers. 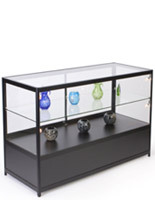 The glass showcase counter is ideal for displaying jewelry, fine collectibles, precious artifacts and much more. 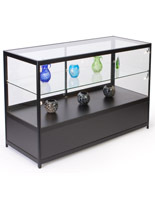 This understated glass display counter will look great in many retail environments, from department stores to gift shops, jewelry stores, museums, schools, business lobbies and more. The glass counter, also known as a glass display counter, features a simple design for use in a wide array of commercial environments. 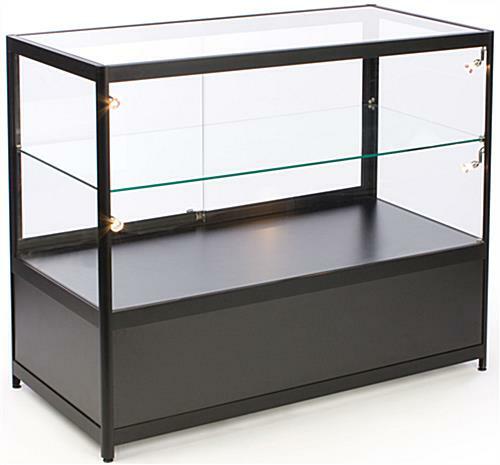 The counter showcase, glass counter is crafted from tempered glass and black laminate to offer a sturdy and resilient display case. Black powder-coated aluminum extrusions offer clean lines with a simple design. 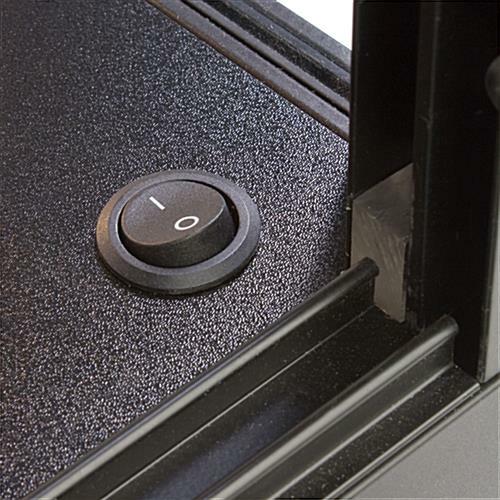 The glass counter has many great features, including four positionable 20-watt side lights to illuminate displayed items and an easily accessible on/off switch (located just inside the sliding doors). 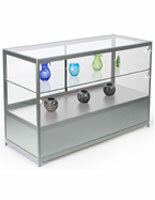 The glass counter showcase features a full-length, adjustable shelf to accommodate various-sized items. 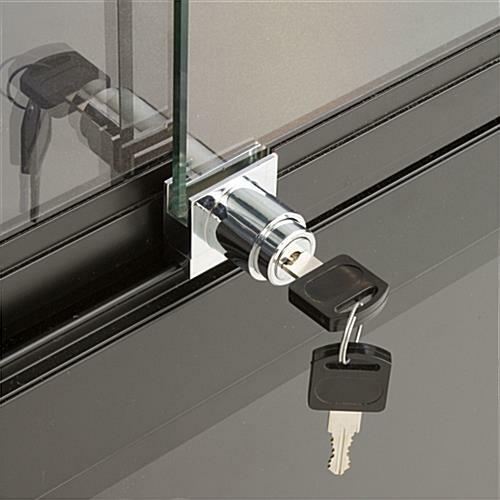 The showcase area of this glass counter is secured by a plunger lock. A full-length lower storage cabinet offers space for back-stock, cleaning supplies and more. 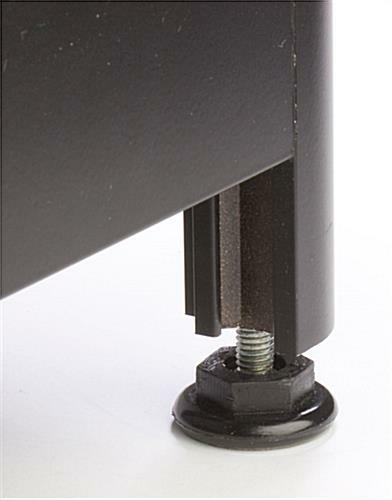 Adjustable floor levelers ensure stability even on uneven surfaces. Ships fully assembled. I purchased these cases, recently I am a regular customer three years ago I bought set of three of the same cases i'm happy generally, I changed the halogen bulbs to more efficient LED bulbs but it killed the transformer/regulator, call the electrician, after the investigation and a hefty bill come to find out that regulator is rated for halogen only. If manufacturer can make a switch to LED capable transformer/regulators that will save consumer the money on electric bill and cases will stay cool because halogen bulbs create heat. I don't think people will mind paying little more for the LED lighting included in the price of a case. I am opening up another shop in the next few months and will come back to your site to see if LED capable cases are available or not. Thank you. Hi Nauroz, Thank you for taking the time to send us your feedback! 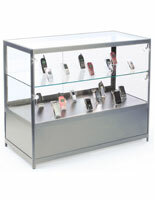 We do have this display case with LED lighting under the SKU [IAPHV48LED](https://www.displays2go.com/P-34005). We're sorry to hear about this hassle, though! One of our customer care specialists would be happy to reach out to assist. Thanks for letting us know! Case looks really nice, came very well packaged. The quality is better than expected. Very rigid, heavy with adjustable feet so it doesn't wobble.